Summer is a great time to grab a bunch of friends, jump in the car and hit the open road – that’s right, it’s road trip season! There’s nothing like spending quality time with your closest friends while heading to your favourite city, campsite or lakeside cottage. However, road trips can be a bit boring (and dangerous) if you’re not prepared. After all, you are confined in a small space for several hours – sometimes days. The best way to make the most of your time in the car is to plan ahead and be prepared. A fun road trip starts with good music and ends with good food; everything else in between is for safety and fun. Whether you pop in a CD, plug in an iPod or connect your phone via Bluetooth, good music is an essential part of any road trip. But good audio doesn’t only need to be a playlist of sing-a-long tunes, it can also include other sources of audio such as podcasts and audio books. This precaution can save you from having to go off-route to find a drugstore. It’s always better to be safe than sorry, so keep a first aid kit on hand. Ensure it’s well stocked with Band-Aids, antiseptic and gauze…just in case. Could you imagine getting out of the car to stretch your legs, and end up locking your keys in the car. 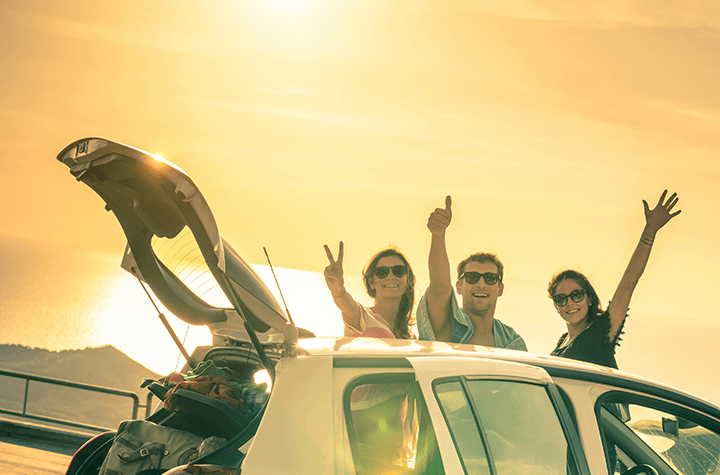 Waiting around for CAA or a tow truck can put a huge damper on your fun summer road trip. It’s best to keep a spare key with another passenger, this way you’ll never get locked out. If you’re spending several hours – or days – in the car, the temperature will change. You don’t want to stop the car, pull over and go to the trunk every time you need a new pair of socks or a sweatshirt. Get comfy in the backseat with blankets, pillows and a warmer change of clothes. Never leave home without it. An emergency car kit should be packed with a flashlight and a flare, in case of an accident. You should also have a spare tire whenever you take a road trip. Passengers can help navigate with a GPS, Google Maps or a route planning app like Waze. Although road trips are supposed to be adventurous, getting lost can add a significant amount of time onto your travels. You love your friends and family, but several people in a small space for a long period of time is bound to come with some odors. Having air freshener on hand will help everyone stay sane – open windows and fresh air help too. Snacks are always good to have on hand and packing food cuts down on costs. Try to limit snacks to finger foods in reusable bags that you can open and close as needed. Drinks keep you hydrated – but more liquid equals more pit stops for bathroom breaks.